Twelve photographs from Baghdad’s Abu Ghraib prison changed the war in Iraq and changed America’s image of itself. And yet, a central question remains. Did the notorious Abu Ghraib photographs constitute evidence of systematic torture and abuse by the American military, or were they documenting the aberrant behavior of a few “bad apples”? 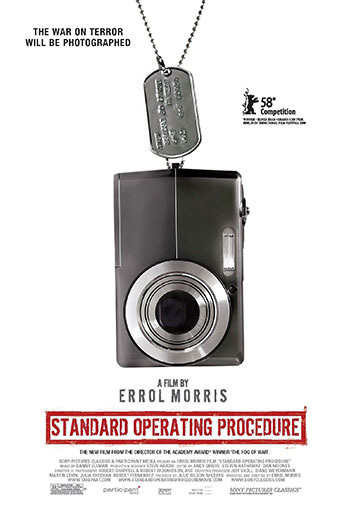 In Standard Operating Procedure, documentary filmmaker Errol Morris (The Fog of War, The Thin Blue Line) examines the context of these photographs. Why were they taken? What was happening outside the frame? Morris talks directly to the soldiers who took the photographs and who were in the photographs. Who are these people? What were they thinking? Many journalists have asked about “the smoking gun” of Abu Ghraib. Standard Operating Procedure answers by illustrating that Abu Ghraib is the smoking gun. The underlying question: how could American values become so compromised that Abu Ghraib—and the subsequent coverup—could happen?